I would love to hear about handmade gifts that you’ve received that was A) great and/or B) disastrous and explain why it was that way, and for the latter, what you would have done differently if you were the giver of the disastrous hand-made gift. Your feedback is welcome & appreciated!! I made a lunch sack as payment for some hair stuff my sister did for me. [A Little Plug for my sister, Emily, If you live in SLC and you’re in the look out for a great cut or in need of an uber talented colorist, go to The Spa Club and ask for Emily.] I made it to match the apron I made her. 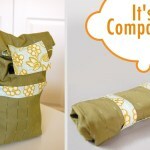 If you missed out on the tutorial for the lunch sack, you can find it here! With all of my friends having baby boys these days, it’s really challenged my creativity (in a good way). Girls are just so much easier to make things for. 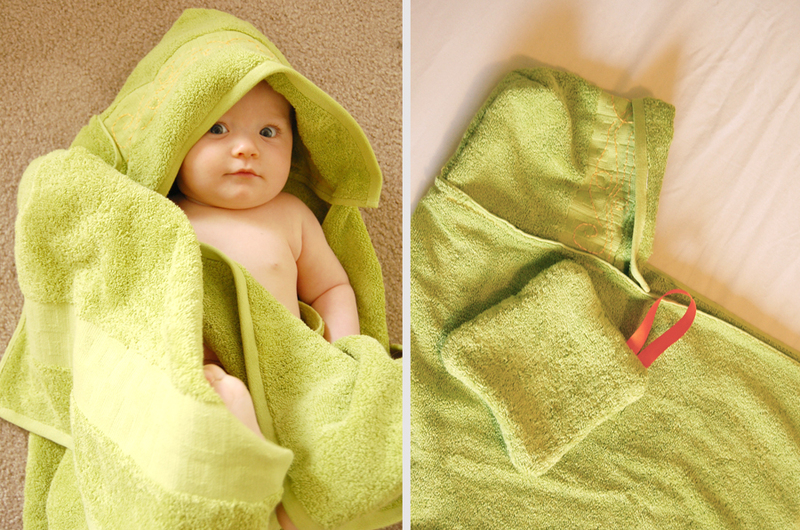 I got this brilliant idea from my Auntie Annie for a hooded towel. She gave me one for Penelope, and I LOVE, LOVE, LOVE it. It’s the perfect kind of gift that goes for both boys and girls (plus it’s nice to have something that baby can use for a long time). I’ll have a tutorial up soon on how I did it. I thought it turned out quite nicely. Also, don’t forget!! TOMORROW IS THE LAST DAY TO ENTER INTO MY GIVEAWAY!! Anyone reading this blog (anyone, seriously) is welcome to enter. GO HERE to enter. I am so impressed with everything you do! PS am I registered for your drawing? And next semester I want to take your water color class. I’m also trying to do all home-made gifts this year and have similar concerns. I am having the hardest time with my in-laws. They are very different from me, have never done homemade gifts and my mother-in-law especially loves to be able to return gifts. I grew up where all we did was homemade gifts (except my Dad who is has a “homemade-gift-making disability) so I have lots of good and bad gift experiences in my repertoire. I’ll start with the not so good gift first. I was a big tom-boy when I was little but my Mom still got me an American Girls doll because all my sisters had one too and she didn’t want me to feel left out. But then every year as she made clothes for the other girls’ dolls she would also sew clothes for my doll. Even though I was little I still felt bad that she went to all that effort to make something I really didn’t like and I wouldn’t have felt bad if I had been the only girl that didn’t get doll clothes for Christmas. Now on to the super star homemade gifts. I’ll give some recent examples because I don’t know if leather moccasins and turtle shell pouches are up your alley. Though I wouldn’t be surprised. My Mom has sewn me some amazing clothes over the years; especially skirts. They are her own creations (no patterns) so they not only look great but they’re unique too. I love them! My sister and sister-in-law gave all us girls a family cookbook a few years ago. The recipes where things like my grandmother’s pumpkin pie as well as recipes that they had collected from all of us as well. My sister-in-law did watercolor paintings for the front and back (it was a 3-ring binder) as well as the dividers. And the great thing is that we keep on adding to it as we each discover a new recipe and then share it with each other. Then there’s the usual but still good gifts: aprons, tablecloths, bags, etc. This year we made a dvd slideshow of our family vacation that we’re giving to everyone. We had to borrow an Apple computer to do it but I believe you already have one. We also made a dvd of pictures of our daughter Eve for Scott’s parents. Easy, cheap but still sentimental and personal. Good luck and keep the postings coming! I’ve already made a purse for Christmas from one of your tutorials. Thanks! Rebekah, I love that you come from a family who gives mostly home-made gifts. I think it makes the Christmas season more about the gift-giving than about the materialism, I find it that way because I spent so much more time thinking about who I was giving to, and who I was making each gift for. Thank you for sharing your experiences. And I love the ideas. Your towels look cute, is that a washcloth? As the mother of teenagers, we have gone to homemade gifts for all their friends (then you don’t have to worry about having a gift for everyone, or how much to spend.) These have been a huge hit for Christmas as well as birthdays. Whitney makes some awesome earrings and bracelets for a dollar or so. Some friends that have allergies she does have to upgrade to silver for the hooks which is a bit more $. I’ll see if she can e-mail you a picture of her creations. She has made “Murray Orange” earrings for her sporty friends who have to wear uniforms on game days. Those are something you can’t find in a store. Also, one year they gave all their friends rainbow polar fleece scarves. It was so easy because the material was a rainbow stripe, we just cut on the line, fringed the ends and gave them to everone. We are big believers in homemade gifts and can’t wait to see your ideas! As the lucky baby shower recipient of the beautiful, soft, cuddly hooded towel, I can say that I looove it. It’s everything I can do to save it for our baby’s use, cause it’s so soft and lovely.